I was really excited to pick up a copy of Midlands Running Guide the other day and find a picture of myself in a police officers outfit inside. b) Stuck my own photograph into a running mag using Blue Peter-esque skills with scissors and pritstick. Or c) Got myself on a “Have You Seen This Runner?” style running blacklist. 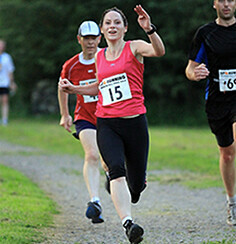 Louise from The Midlands Running Guide had emailed me and asked me if I wanted to tell her about my favourite race. This of course sounded dreadful. All of us runners absolutely DETEST talking about running and races and missing toenails and blisters. So of course I declined. I did however restrain myself from talking about manky feet. I don't want to spoil the fun but I did struggle with choosing my favourite race. There have been some AMAZING ones. There are skeletons and ghouls running it. It’s at night – very spooky. It’s got MASSIVE hills – which means massive downhills. It’s fancy dress - There are skeletons and ghouls and corpse brides and dead cheerleaders running it. There are massive cows – reason to run a bit faster and get a course PB. And a dressed-as-a-police-officer PB. 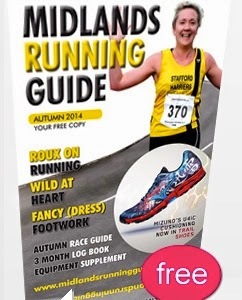 If you want to get yourself a free copy of the Midlands Running Guide, it's available here or you can have a look at their website which has info on local races and results, news, shops and running advice. Haha so glad this was your favourite, think it was one of my favourite posts of yours! I flipping LOVE this race!! Excuse to dress up, run around trails in the dark and get an awesome medal. Ooh - AND a toffee apple at the end!! Anyway, everyone knows the best races have loads of hills and cow poo in them :) liking your choice!